Young people are the lifeblood of our business. Pointer doesn’t simply pay lip-service to the training of young people; as with everything we do, we take genuine pride in developing proper people who share our values and want to do a proper job every single time. Our experienced engineers train hand-picked apprentices in the skills of physical, electronic and cyber security. Pointer Limited started training apprentices in 1976. The commitment to training and apprentices was driven by Bob Rowan, founder of Pointer Limited. Mr Rowan was also a past chairman of the Security Industry Training Organisation and of Glasgow Opportunities. Pointer Limited are also award winners. We were awarded a National Training Award and a Special National Training Award in 2003, these awards are in recognition of companies who have placed training at the heart of their business strategy. We are a recognised trainer by the Scottish Qualifications Authority and Skills for Security. Apprentices are an important part in our business and we have trained our own apprentices for over 40 years. To date we have trained over 160 apprentices. Due to the success of our scheme, we train apprentices from other security companies. Pointer have a policy to train and develop Modern Apprentices. In Scotland, this is completed in-house with a dedicated member of staff to deliver our training program. In England, the apprentice attends college in Birmingham or London. In Scotland, Modern Apprentices achieve the national accredited Modern Apprenticeship in Providing Security, Emergency and Alarm Systems, SQA Level 3, which is based on our National Occupational Standards and a Professional Development Award in Security Systems Engineering. In England, major changes to apprenticeships were introduced by the Government in 2017 and replaced by the new ‘Trailblazer’ Standard Apprenticeship – the Fire, Emergency and Security Systems Apprenticeship Standard. These are completed within 3 years with additional training included from suppliers and further technical training. Modern Apprentices also gain work experience while they learn new skills on site and will have the opportunity to work on high security applications including biometric scanning technology, video analytics applications and internet transmission systems all over the UK and possibly further afield. Pointer also has in place “career path”, an internal training and development programme which offers staff the opportunity to develop their skills on a continuous basis up to and including studying at University. This has enabled the business to adapt successfully to working in a project environment, and to manage the change from analogue products to digital products. 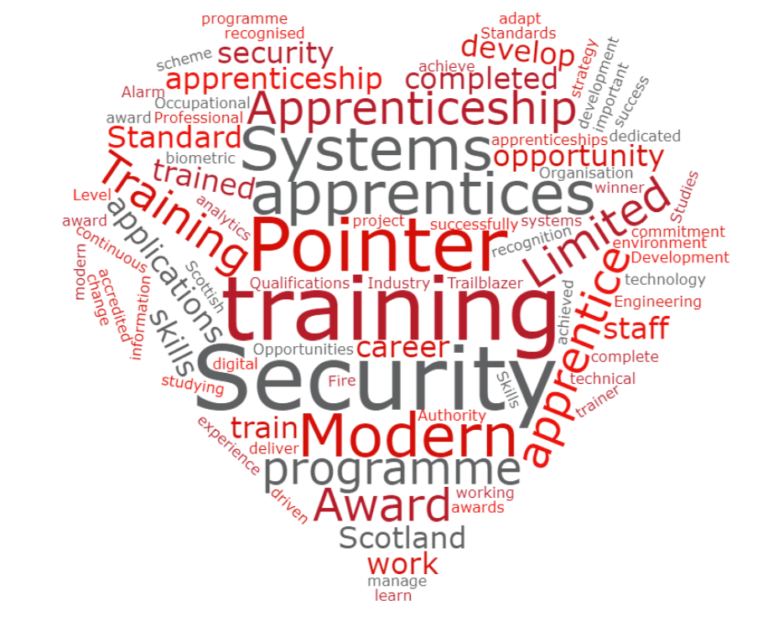 Through our career path 66% of managers in Pointer started off with our Modern Apprenticeship programme. Pointer continues to grow year on year and we are always on the lookout for sharp and smart qualified staff who share our values and work ethic. In fact, embracing the Pointer vision and values are at the heart of everything we do every day. We offer great careers for engineers, designers, sales, finance, customer service and many more. All employees have opportunities to develop their skills through relevant training. We also recognize and develop employees who may have particular skills sets of customer value. We also strongly believe in promoting from within the business so becoming a team member opens you up to endless possibilities. In return for our amazing teams’ loyalty, hard work and dedication, employees receive competitive salaries and attractive benefits.